It&apos;s having a 5.5 inch full HD screen. A really great camera with smooth performance. The Vivo V3 Max is fast, has a good display, intuitive UI and passable battery life, but loses out on camera performance, and a boring build. The major factor, though, is its price. the better overall device in every parameter. it does not have good camera and lags fast charging. Vivo V3 Max is a a decent phone, I wouldn&apos;t praise it a lot. I have been using it for about a month now and I regret buying it. I would suggest all of those reading to purchase other phones like the ones offered by Xiaomi and Motorola which are in the same price range. This phone has the screen factor right, but falls short in many other factors. Like the design is same old. Battery would last for a complete day on single charge but you cannot do heavy gaming otherwise it gets heated up and lags. Camera is amazing in bright light. Vivo V3 Max is a device which has great price to specs ratio. You&apos;re getting quick charging, fast fingerprint and excellent performance. Cameras on the other hand is not that great making this device lag behind from the competitors. The UI here is also not that optimised lacks various customization. 5 Pricebaba users have written their experience with Vivo V3 Max. If you own Vivo V3 Max, please do leave your feedback too. Sponsoring the IPL 2016, Vivo is back with their new devices Vivo V3 Max & the Vivo V3. The two devices focus majorly on feel & design, thanks to the Metal Unibody construction of the device. The Vivo V3 Max is the elder sibling of the Vivo V3 in terms of bigger & better display, better performance, camera & bigger battery. The device sports a big 5.5 inch display with a resolution of 1920x1080 pixels, that gives the display a pixel density of 401PPI. The camera on the Vivo V3 Max is a 13MP sensor that can record videos up to 1080p and on the front is a 8MP camera sensor for those selfies. There is also an LED flash below the rear camera. Below the camera lies a Fingerprint sensor on the back of the device for that quick & secured access to your personal content on the device. In terms of performance the Vivo V3 Max has a Qualcomm Snapdragon 652 Octa Core chipset that is clocked at 1.8GHz and combined with it is 4GB of RAM. The phone supports Dual Micro SIMs and both are 4G enabled. You get 32GB of internal storage with expansion option up to 128GB via a MicroSD card. The phone is based on Android Lollipop (5.1) out of the box with Vivo’s FunTouch OS 2.5 running on top of it. Vivo V3 Max is powered by a 3000mAh non-removable battery and will be available in three colours viz. Gold, Rose Gold & Silver. 1. Will Vivo V3 Max support Reliance Jio SIMs? - Yes, the Vivo V3 Max does support VoLTE and will work with Reliance Jio network. 2. Is this a good phone for gaming? - Looking at the specs, the Vivo V3 Max looks like an excellent choice for gaming. It should handle all high-end games from major publishers without any performance issues. 3. Will this get further software updates of Android? 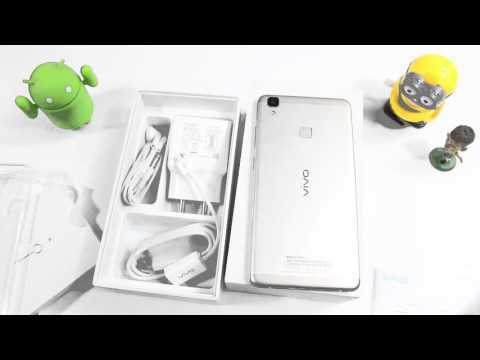 - Vivo V3 Max ships with Android 5.1 Lollipop and is not expected to receive any future Android updates from the brand. - With the V3 Max you get an onboard storage of 32GB out of which around 23.6GB is available to the user for installing apps and store other data. 5. Is the battery removable? - Having a metal unibody construction, the battery of the phone is non-removable. 6. What comes in the box? - In the box, you get Vivo V3 Max, a wall charger, charging and data syncing cable, a pair of earphones and a SIM ejector pin.